If you are not aware about how to take a screenshot it could consume your lot of time in searching for the solution for your query “How do I take a Screenshot”. But taking a screenshot is not that much a hectic job as if you know the proper method to take a screenshot you can capture a screenshot in few seconds. Taking a screenshot in various devices doesn’t need any third party software to be installed on your device, as on every device there will be an inbuilt function in the Operating System to take a screenshot without installing any software on your device. 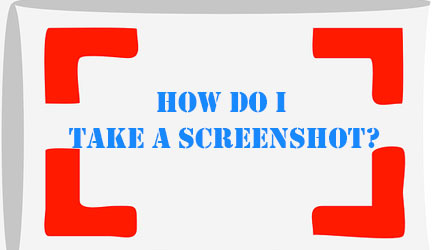 Taking Screenshot becomes essential during various situations at some time or other for e.g. you want to take a screenshot to show the error appearing on your device to an expert or technician, taking screenshot of funny chat or conversation, or if you want to create a tutorial of an ongoing task on your system to submit it later to Wikihow articles etc. So this guide on How do I take a screenshot will explain you on how to take a screenshot in various devices operating systems like Windows, MAC OS X, Android, iOS, Chromebook, which you use daily. With the below method to take a screenshot on Windows PC will work on all Windows Operating Systems such as Windows 10, Windows 8.1, Windows 8, Windows 7, Windows Vista, and Windows XP. To take a screenshot of entire screen of windows based PC find Print Screen key on your keyboard and press it, once you press the key Print Screen on your keyboard the screenshot will be copied to your clipboard. Now just open paint application and paste the screenshot by pressing Ctrl + V or by manually clicking on Paste option available in the Paint Application and then you save the captured screenshot by hitting on save button with your desired image format. Select the window by clicking on the window which you want to capture screenshot, and then press Alt + Print Screen from your keyboard. Now open the paint application and paste the captured screenshot into the paint application and then save it. Taking a screenshot on a MAC OS X PC is different as on keyboard you will not find any hint to take screenshot as on Windows OS. Below are the various ways with which you can take a screenshot on a MAC PC, these methods to take a screenshot on MAC will work on all versions of MAC OS X. There are two ways of taking a screenshot of entire screen on a MAC PC. Press Command + Shift + 3 will capture the screenshot of entire screen and automatically it will save the image file on your desktop, the file name will usually look like “Screen shot 2014-11-30 at 05.55.00 AM.png”. Press Command + Control + Shift + 3 will capture the screenshot of entire screen but file will not get saved on your desktop instead it will copied to your clipboard which you can paste into any document or image editing software. If you want to capture a screenshot of selected window or selected area you can do it for that you will have to follow below instructions. Press Command + Shift + 4 will give you a selection tool to select the area which you want to capture or you can even hit spacebar and click on the window which you want to capture. After taking the screenshot it will save the image file on your desktop, the file name will similarly look like “Screen shot 2014-11-30 at 06.25.00 AM.png”. The new users of Chromebook OS might be un-aware about How to Take a Screenshot on a Chromebook. Few combination of hot keys can take a screenshot on a Chromebook so which are those hotkeys which will help to take screenshot on a Chromebook OS let’s find out below. If you want to capture the entire screen on your Chromebook follow the below combination of hotkeys. Press Ctrl + Window Switcher simultaneously, upon pressing these keys your screen will flash white and you will get the notification that your screenshot was successfully captured. If you need to take screenshot of selected area of the screen on a Chromebook than use below hot key combination. Press Ctrl + Shift + Window Switcher, and drag the area which you want to capture with the help of your mouse and once you have selected the area release the click and the screenshot will get successfully captured you will also get the notification saying Screenshot taken. To view your captured screenshot of the screen you can click on the notification as well as you can find the captured screenshot on your Chromebook in downloads folder. Taking a Screenshot on Android is almost same on all Android Version devices, below are two methods with which you can try taking a screenshot on Android. Press and hold down at once Volume Down + Power Button for one to two seconds, and as soon as you screen flashes white you a have done taking a screenshot on Android. The Captured Screenshot will be found in the gallery. If the first method to take a screenshot on android didn’t helped you than you can try out the second method to take a screenshot on Android. Press and hold down at once Home + Power button for one to two seconds, as soon as your screen flashes white you are done in taking a screenshot on Android. Later on you can view the captured screenshot by going to gallery. Taking screenshot on all iOS devices like iPhone, iPad, and iPod Touch is almost the same. With below method you can easily capture your screen. Press at once Home + Sleep/Wake and when the screen flashed white, that means you have successfully captured the screen which you can find by going to Photos app on your iOS device. Press Power + Volume Up button simultaneously, the captured screen will be stored in Screenshots Album which you can find in Photos Hub. (This combination of keys to take a screenshot on a Windows Phone will work only on Windows Phone 8.1 version). If you have Windows Phone 8 you can try out the below key combinations to take a screenshot on a Windows Phone. Press and hold Start + Power simultaneously to take the screenshot of the screen. Hope this guide have solved your problem about your query How Do I Take a Screenshot in various devices. If you had any problem while taking screenshot you can comment below with your problem.